Marathon running is in full swing in February and those who still need to run a qualifier have 24 great options to choose from all around the country. Unqualified Two Oceans runners should be looking to get a marathon under the belt so that there is no pressure for the 18th of March cut-off. There is something for everyone – although big marathons like the Witness Maritzburg City, Jeppe, Deloitte Pretoria and Cape Peninsula dominate the calendar, it’s the small ones that grab my attention. The Zelco Motor Spitskop and Beaufort West Municipality marathons are what I believe the two smallest qualifier marathons in the country with nine and ten 2018 finishers respectively. Note to the reader: I am aiming to publish a monthly article detailing all the marathons and ultras on the South African running calendar which can be used as a definitive resource for the discerning marathon runner when picking their qualifiers and planning running holidays. Let me know if you have anything to add! For a fast time (those chasing a seeding): My pick here is the Witness Maritzburg City Marathon – the race that more runners use as their qualifier than any other. 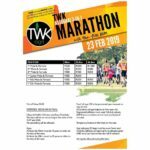 For a good time (marathons packed with personality): TWK Assegaai Marathon. 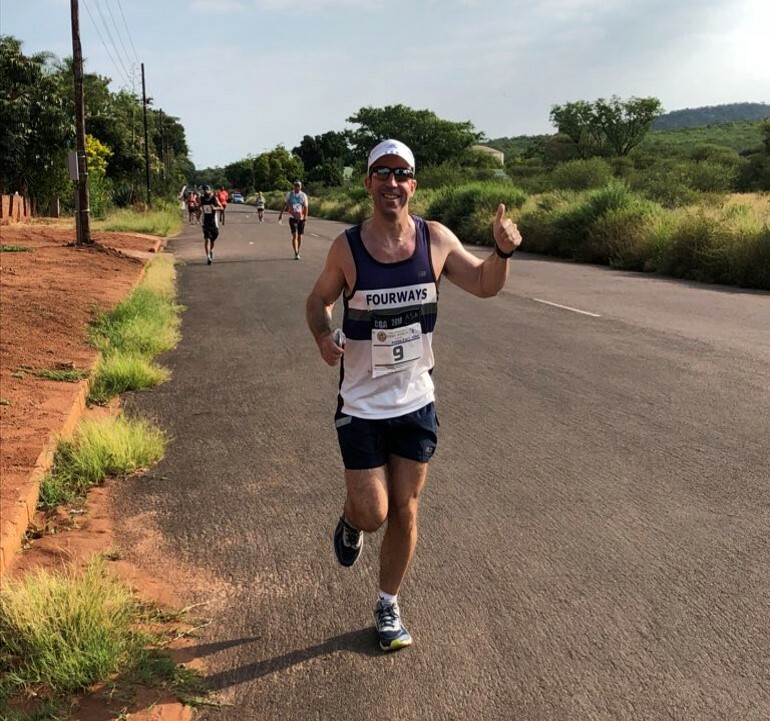 A great marathon near the Swazi border – I loved this race in 2018 and I’m sure you will have a great run there in 2019. 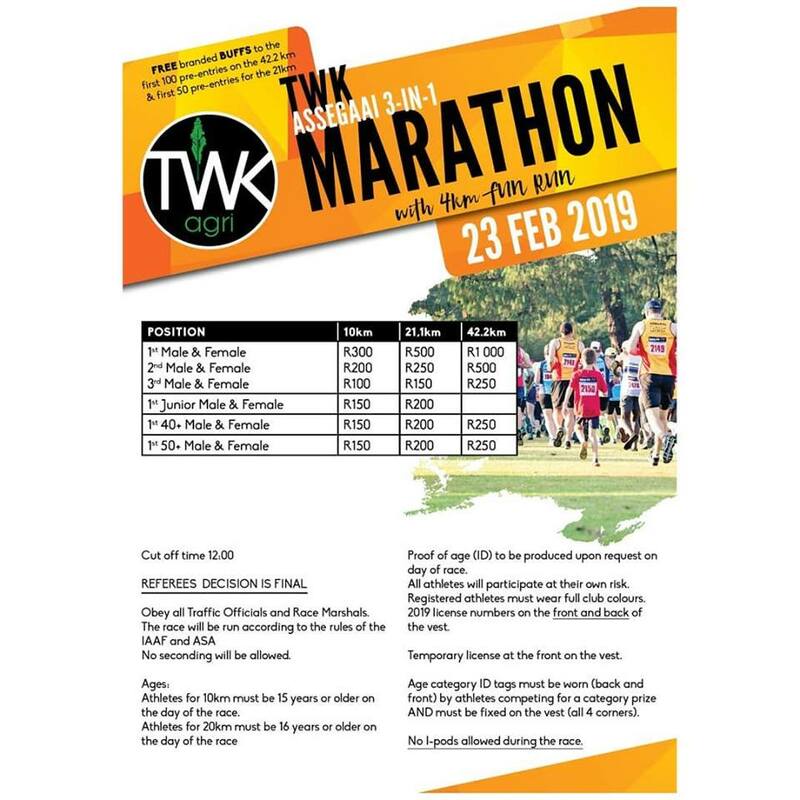 For a special time (hard to get to races that all ‘real’ runners should do at least once): The Zelco Motors Spitskop and Beaufort West Municipality marathons. * This is also a great way to steer boring conversations (on any topic) to a much more exciting conversation about running. What I’ll be running this year: The Meerkat, Klerksdorp, Bestmed Tuks and Richards Bay Hippo marathons. All race information, links, flyers and travel guidance* verified with race organisers (unless otherwise noted). * For practical reasons, all directions are from central Johannesburg as (1) the majority of runners are Gauteng based, (2) I live in Johannesburg and (3) whilst all roads might lead to Rome, all roads in South Africa lead away from Johannesburg! Runners head out through the historic Kimberley streets during the Meerkat Marathon (photo supplied). Race Description The circular route provides a great on foot tour of some of Kimberley’s historic sites like the Big Hole, Rhodes Memorial (with canons and other artefacts from the Anglo Boer War), the Northern Cape houses of parliament and the Star of the West (the oldest pub in South Africa). The route also traverses through the local township of Galeshewe and promises a carnival-like atmosphere at the finish line where all participants enjoy a complimentary hamburger. Why Run It? Have a beer at the oldest pub in South Africa – the Star of the West – before, after or during or your marathon . If your legs are too tired after the race, you can always try the Halfway House – the first drive-in pub in South Africa. What Else To Do There? Go digging for diamonds at the ‘Big Hole’ complex; Check out the historic battlefields as well as various memorials and museums; Have a beer at the Star of the West – the oldest pub in South Africa. There are also a few game viewing options within close driving distance. One of the great tables at the Sasolburg Marathon (photo supplied). Race Description Obtuse, acute, right: Regardless of which angle you look at the Vaal Triangle from, you are in for a hot run through flat industrial landscapes. However, the people of the Vaal Triangle are proud of their towns, so much so that they all make you run around them twice. Sasolburg, founded in 1954 as a housing project for the local Sasol petroleum refinery (and the bottom point of the Vaal Triangle), is no exception: A fast and flat marathon that gives you a two-lap tour of the town. However, the race organisers have some mercy on their runners and ensure that there is plenty of shade along the way – and what the area lacks in natural beauty they make up for with some spectacular waterpoints. Why Run It? Highly recommend as a qualifier. The runner numbers are just enough to give you company and support without being congested. Sasolburg is just over the ‘border’ – so this is the easiest way for Gauteng runners to add a Free State marathon to the running CV. How To Get There? 80km (1h) drive along the N1 or R59. Accommodation Options Drive through in the morning or check out Google options. What Else To Do There? Spend the afternoon enjoying activities and water sports on and along the Vaal River. Race Description The race promises to be an early season fitness tester that offers some of the finest views of Middelburg. Why Run It? Proceeds from the race are channelled back into the local community. How To Get There? 160km (1h45) drive using N12 or N4. Start the Bay Ultra with a sunrise over the Indian Oceans and finish with 20km along pristine Eastern Cape coastline (photos supplied). Race Description The people of PE don’t muck around, skipping the standard marathons and starting their running year off with an ultra. This was one of my favourite races from 2018 – a lovely 50km route with plenty of climbing over the first half before you drop back to sea level and a 20km Marine Drive finish along pristine Eastern Cape coastline. Running in Port Elizabeth is always a treat – you’ll definitely get to experience the ‘Friendly City’ – but hopefully you’ll get a gentle sea-breeze and avoid experiencing the ‘Windy City’. Why Run It? See a magnificent sunrise over the Indian Ocean whilst taking in the first ultra on the South African running calendar. Aspirant IronMen (and Women) can also get acquainted with Summerstrand, which also plays host to the South African leg of the IronMan. How To Get There? 1050km (11h) drive or a 1h30 flight (you can normally find a return for about R1,500). Accommodation Options There are a number of great hotels along the promenade for various budgets including The Boardwalk Hotel and Casino, The Radisson Blu Hotel, The Garden Court Hotel and the Courtyard Hotel. There are also well priced B&B options a short drive from the beach. What Else To Do There? The Eastern Cape brands itself is ‘the adventure capital of South Africa’. Activities include big 5 game viewing, the longest zipline in SA, great blue flag beaches and sand boarding. 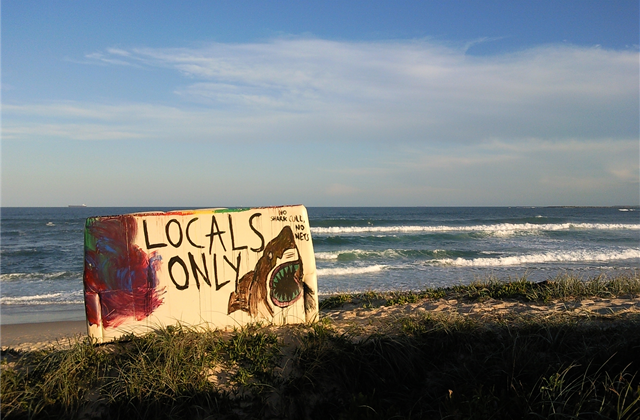 Port Elizabeth has earned the nickname, ‘The Friendly City’ for its incredible hospitality. 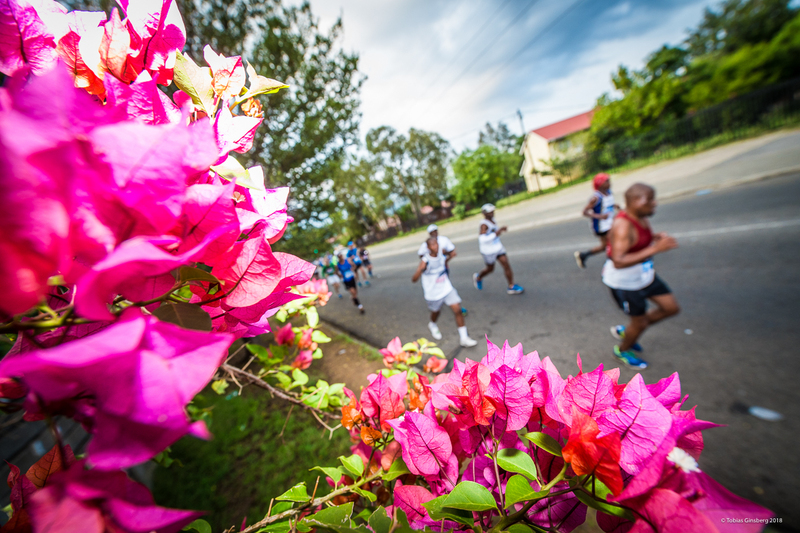 Enjoy the best of town and country at the Potties Marathon. Race Description An interesting double-lapper (you don’t get too many of those) on a flat route that includes a bit of dirt road running along some game farms. If you like experiencing town and country on the same run this is a good one to do. I always thought this race was in Potchefstroom but it takes its name from the former name of Mokopane – Potgietersrus – which was the town’s name when the race started. Why Run It? A fast and friendly marathon that boasts being “the cheapest race in the north” – and your entry fee also includes a great goodie bag. 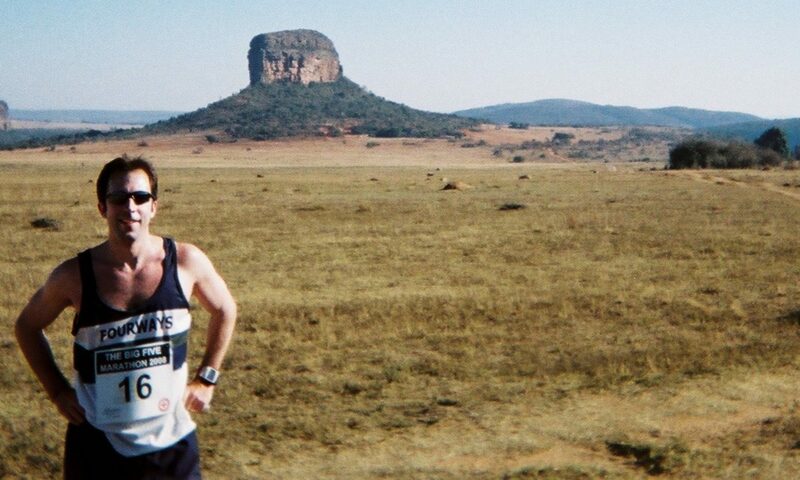 Spitskop Marathon is run entirely through a game reserve (photo supplied). Race Description A relatively easy double-lap marathon with one major hill (around the 17/38km mark). 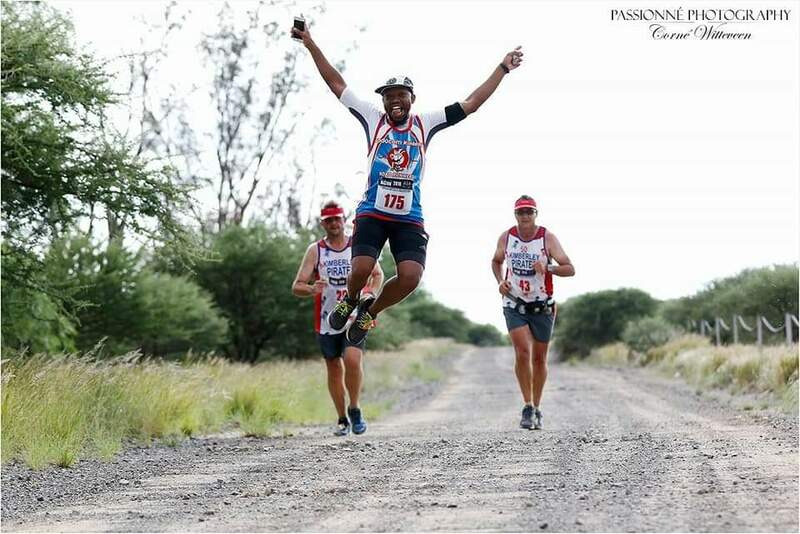 The entire route is run on a game farm in the Kalahari Desert offering spectacular views and an opportunity to run one of only two marathons in Upington (and the North Western Cape Athletics region). Enjoy a complimentary hot dog and a beer after you’ve conquered a marathon in the Kalahari Desert. Why Run It? Together with the John Nugent (Upington’s other marathon), this is officially the hardest marathon to get to in the country: A 9-hour+ drive from all South Africa’s major cities or a very expensive once-a-day flight on SA Airlink. However, if you want to say you’ve run all over South Africa you need to notch up a marathon in all 19 athletics provinces – and this is the perfect opportunity to do so in the North Western Cape region. What Else To Do There? Sample the local wines at Orange River Cellars followed by a sunset cruise on the Orange River. The spectacular Augrabies Water Falls (and national park) are just 120km away. 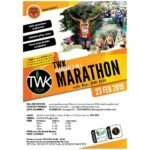 Race Description The largest town in the North West province boasts a well organised, fast and flat marathon with great water tables. This is a circular route with and out-and-back ‘pan handle’ section along farm road from 14km to 35km. The first 14km and last 7km are through the suburbs. There is just one hill in Klerksdorp – and of course they make sure to show it off to their visiting runners during the marathon. However, the good news is that the highest point of the route is around the 25km mark – so a fast finish is in store for runners who pace themselves well. The 2019 race is organised in collaboration with The Aurum Institute – a leading healthcare organisation that has been successfully battling the joint scourge of HIV and TB for the past 20 years. Why Run It? Get away from the crowds and enjoy one of the great hospitality of a small town marathon – and cool down after your marathon with a dip in the high school pool. Get to run up and down the only hill in Klerksdorp. How To Get There? 170km (2h) drive along the N12. Race Description The race has a new route in 2019 but the same great sponsor (Kloppers have sponsored the race since its inception 29 years ago). 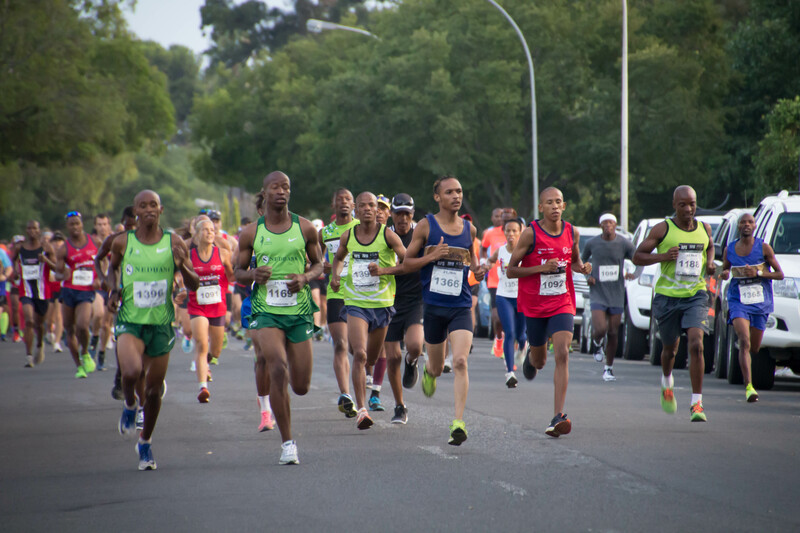 For those who’ve never run around the City of Roses, it can be surprisingly hilly – but the organisers have made sure they keep the climbing to a minimum with the objective of securing a good qualifier for their runners. Why Run It? A good qualification option for the Free State runners. How To Get There? 400km (4h) drive due south on the N1. Title Sponsor Your Company Name Could Be Here! Race Description One of the highlights on the Joburg running calendar. 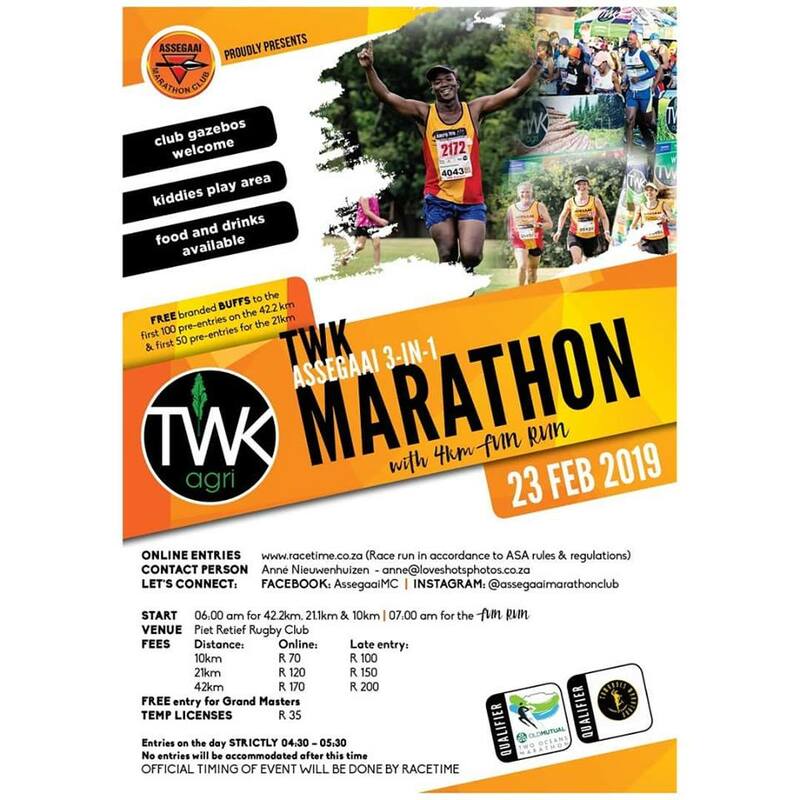 Sadly, this race lost its sponsor last year but the same great vibe and spirit will still be there as 6,000 athletes (3,000 in the marathon) hurtle around Bedfordview and Edenvale. 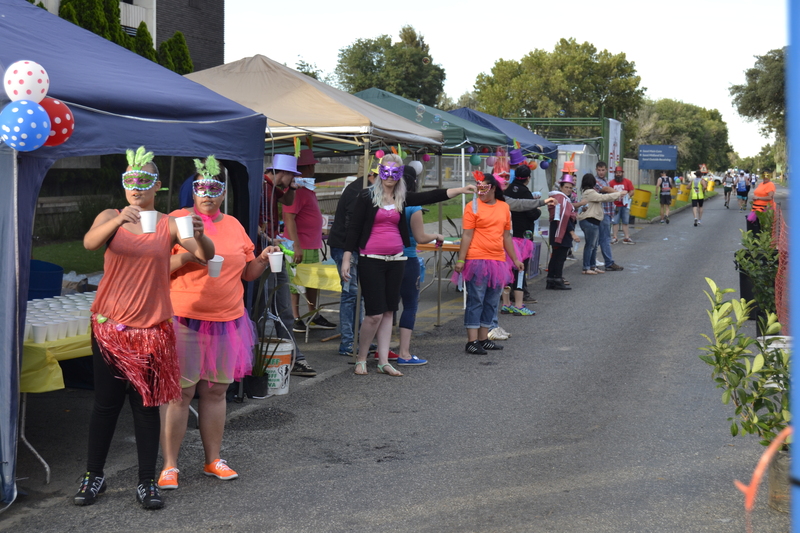 Local businesses try to outdo each other by putting on the most impressive hydration station. Some runners think this course is tough (but they are wrong and need to get out more). Although there are one or two short, sharp steep pulls, most of the climbing is gentle – the highest-lowest point elevation difference is just 76m. You also do most of the hard work on the first half of the lap, hit the highest point (1672m) and then fly home from Gillooly’s Farm to the finish (1596m). You just need to remember to leave a little in the tank for a nasty pull in the last kilometre. 1. The race will act as the host for the CGA champs this year, so you can rub shoulders with (and eat the dust of) the best marathon runners in Johannesburg. 2. Almost every traffic report (local and regional) mentions snarl-ups at Gillooly’s Interchange – get to see the farm after which the interchange was named (and hope there is not too much running congestion during the race). 3. If you own a company or represent a corporate looking to sponsor a great event, come and check things out – Jeppe are actively looking for a partner/sponsor to keep one of South Africa’s iconic running events operating at the same level of prestige it has occupied on the sporting calendar over the last three decades. How To Get There? 11km from central Jhb but race day traffic is very congested so allow extra time. What Else To Do There? Enjoy the post-race activities and atmosphere at one of the best finish venues in the country. 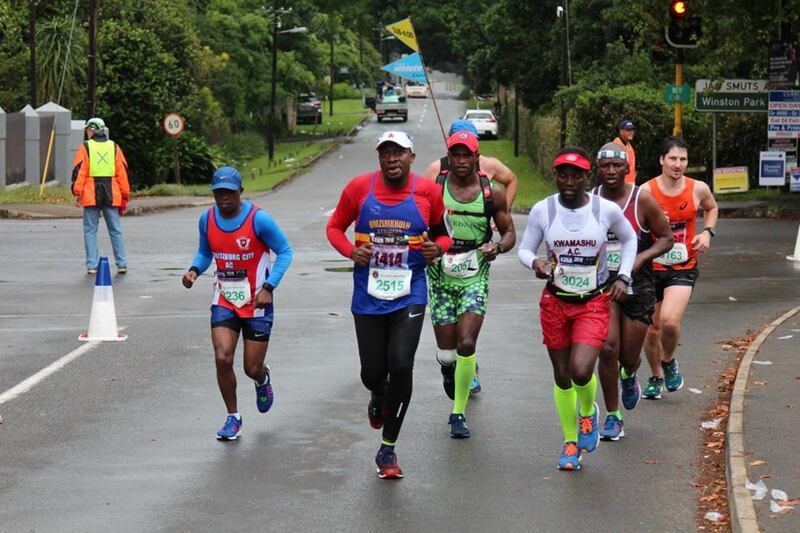 Get acquainted with this section of the Comrades route during the Hillcrest Marathon (photo supplied). Race Description Whilst most other provinces already have a couple of marathons under the best, this is the first opportunity to run a Kwazulu Natal qualifier. The marathon prides itself on its friendliness and great refreshment tables. An early 5am start and a well-shaded course through the suburbs provide some relief from the Durban heat and humidity. Why Run It? The route provides the astute runner an opportunity to get acquainted with the undulations and atmosphere they’ll encounter on their way up to Pietermaritzburg during Comrades later in the year. How To Get There? 550km (5h30) drive or 1h flight to Durban and 60km drive from King Shaka Airport. 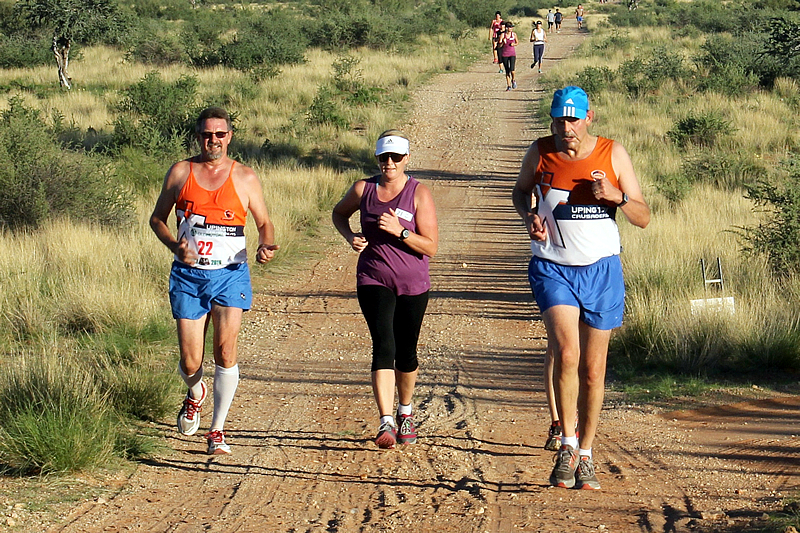 Race Description Your chance to run a marathon in the Karoo Desert. 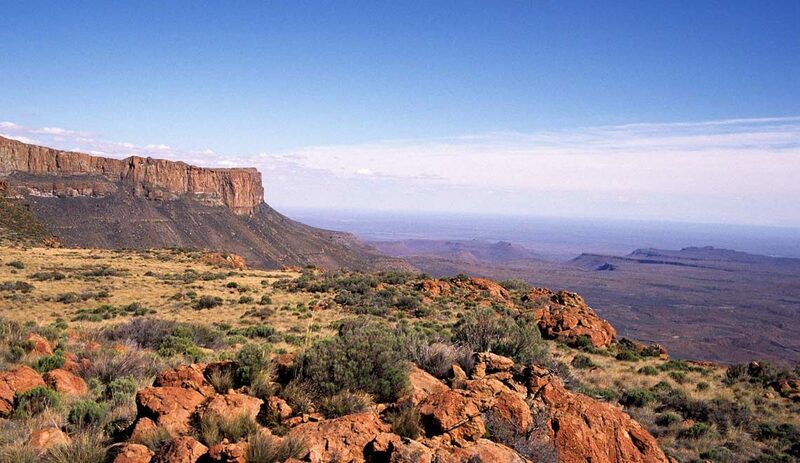 This is a flat, out-and-back route that starts and finishes on Karoo National Park. One of the more difficult races to get to but it promises a fantastic experience once you are there. It has just gone onto my bucket list and is likely to feature in my 2020 running plans. Why Run It? Experience the loneliness of the long distance runner whilst taking in the unique beauty of the Karoo Desert. Just ten runners – all men – completed the marathon last year. You’ll need to run a 2:40 marathon to win the men’s race but just need to finish a desert marathon to become the women’s champion. How To Get There? 950km (9h) drive south along the N1 or fly to Cape Town and 450km (4h) drive. What Else To Do There? Explore the natural beauty of the Karoo National Park, go on a traditional donkey cart ride and visit the Chris Barnard Museum (Barnard was the first doctor to successfully perform a human-to-human heart transplant and was born and raised in Beaufort West). 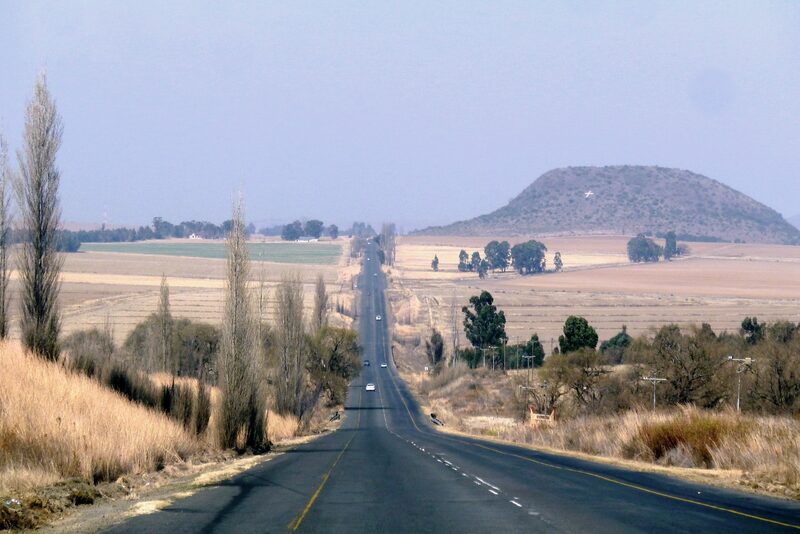 Enjoy the rural roads of the eastern Free State during the Bielie Mielie Marathon (photo supplied). Race Description Although the town of Reitz is small in size they are big on mielies – and have one of the largest maize silos in the southern hemisphere. The marathon forms part of the Bielie Mielie Festival – a long weekend full of festivities, sporting activities and ‘lietjies’ from the best Afrikaans talent in the industry. The out-and-back route is run over undulating country roads while competitors take in the atmosphere of the eastern Free State. Why Run It? Stick around and experience some local culture at the festival. The energetic and competitive can take part in the ‘Boeresport-kompetisie’ later on Saturday afternoon together with your favourite local soap opera stars. If my translation abilities are correct, activities include eiergooi (egg-tossing), mieliepit eet (competitive corn consumption), sakresies (sack races), trekkerband trek (tractor tyre pull) en baaldra (hay bale tossing). How To Get There? 215km (2h) drive south. What Else To Do There? In addition to the action and entertainment packed Bielie Mielie Festival, there are game reserves, golf courses, hiking trails, 4×4 trails and many resorts and spas in the area. Race Description If you thought single-lap races were extinct in Pretoria you’d be wrong – they returned in 2018 with the inaugural Tuks Marathon. 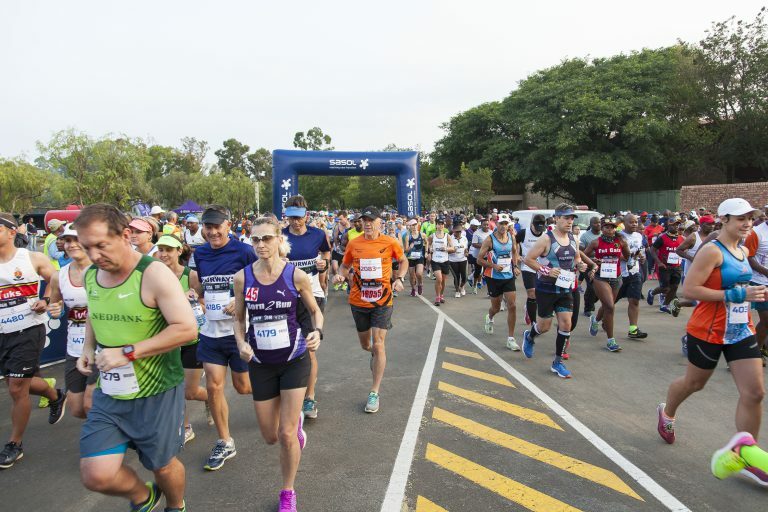 The University of Pretoria is one of the country’s leading institutes of higher learning – and enrolling in this course will involve stringent tests and rigorous examinations over a tough route that crams almost every hill in Pretoria into one marathon. However, those who do graduate after 42.2 gruelling kilometres, know that they’ve earned a quality undergraduate degree – and are on the fast-track to honours at Comrades. The good news is that your tertiary education isn’t complete without a party or two – and this race offers festive tables as well as musicians and bands along the way to ensure that there is a bit of playtime amongst all the hill work. Why Run It? This is Gauteng’s only single-lap marathon north of the Jukskei and the hills you’ll conquer over the course are a great way to get your legs ready for Comrades. How To Get There? 75km (1h) but allow extra time for traffic. Race Description A fast and flat route around Limpopo’s capital city. The route isn’t going to win any beauty competitions but is a good option as a qualifier for those in South Africa’s northern outreaches. The race strives to be the premium marathon in the area with a total prize purse of R150,000. Why Run It? All Comrades 2018 gold and silver medallists who complete the marathon will receive R500 Sportsman’s Warehouse voucher to assist them with their 2019 training plans. For those further back in the field, join Rocky’s bright yellow pacing bus for a fun-filled qualifier. How To Get There? 325km (3h) drive due north on the N1. Race Description After Sasol founded Sasolburg, they decided to establish a second town around the nearby coalfields of Mpumalanga. They called the town Secunda (which I imagine narrowly beat out Sasolburg II in the naming stakes). Sasol retains their dominance on the area by sponsoring both the Sasolburg and Secunda Marathons. The Secunda marathon is your standard, flat, industrial double-lapper. If running to the backdrop of massive cooling towers, smoky chimneys and giant steel constructions is your thing then this is the race for you. 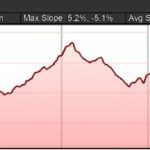 The race claims to be provide slightly more variety than their sister town of Sasolburg with a few gentle undulations to stop your legs from going to sleep – and if you are feeling tired the lively support tables will give you a boost. Why Run It? A good option for a fast qualifier without the Gauteng crowds. How To Get There? 130km (1h30) drive east along the N17. Note: It seems impossible to get any response from Cape Town race organisers. I am 0 for 2 in 2019 despite fairly vociferous hassling. Not sure if they don’t want any up-country runners running their marathons and/or they have developed an app that automatically filters inland emails. If anyone knows anyone from Celtic Harriers or Top Events please ask them to check their spam folder. Race Description A point-to-point marathon with plenty of running along the coastline. A fast, flat, easy marathon – unless the South Easter wind blows! How To Get There? Fly to Cape Town; Green Point is 20km and Simon’s Town 45km from the airport. What Else To Do There? Apart from the plethora of Cape Town sight-seeing options, the finish venue in Simon’s Town provides the opportunity go for a swim with the Penguins at Boulders Beach (and ice your legs in the Atlantic Ocean) – or go further offshore to watch southern right whales from the comfort of a boat or great white sharks from an underwater cage. Simon’s Town also has a number of museums including the South African Naval Museum. Experience the best support table in the country during the Assegaai Marathon (photo supplied). Race Description An excellent race close to the Swaziland border. The route is really simple – you run all the way to the Assegaai River and then you turn around and run back again. The first 8km provides a gentle climb and then you have a long gentle decline before a final plummet to the river. This means that the Assegaai stabs you in the back with lots of climbing over the second half. Local legend has it that if you drink from the Assegaai river, it will forever be in your blood. Local common sense has it that if you drink from the Assegaai river, you will have a severe case of explosive diarrhoea. The motto of the organising club is “Laat waai, Assegaai” which translates as “Let loose, Assegaai” – one glass of unfiltered river water and you’ll definitely be letting loose all over the place! Why Run It? The race entry is worth is just to experience the Charka support table – undoubtedly the best table I’ve ever had the pleasure of frequenting. Tables are every 2km along the route and compete for prestigious annual trophies. How To Get There? 330km (4h) drive along the N17 and N2. Accommodation Options www.booking.com offers quite a number of reputable Piet Retief guest houses travelling runners can book for the weekend. Race Description The race takes its name from what is claimed to be the deepest hole excavated by hand – Kimberley’s ‘Groot Gat’ (or Big Hole) – and the relatively easy circular route that takes one through the Big Hole complex. There is a tricky off-road section through a working quarry to negotiate before one heads back into Kimberley. Much of the marshalling is done with the assistance of the residents of the Yonder Home for Mentally Impaired – a really nice touch and a great reason to give your marshals a friendly greeting. The race is organised by one of the oldest running clubs in the country, Pirates, who are celebrating their 135th anniversary this year. Why Run It? Earn your “Groot Gat” t-shirt and wear it with pride – and see the mother club that gave birth to the truant child that is Greenside Pirates. Race Description After a long absence, marathon running returns to Richards Bay with the ‘Hippo’ – a super flat double-lapper at sea-level through the suburbs of Meerensee and Arboretum. The start/finish venue is across the road from the main beach in Richards Bay and is a family friendly venue with a club kitchen and bar. The race is offering ten free campsites on a first come, first served basis (each campsite can accommodate 6 people and has a tap, electricity and a braai). To compensate for the expected heat refreshment tables are 2.5km apart, will have ice baths and each runner will be issued with an ‘old school Comrades’ sponge at the start to prevent overheating. Why Run It? Run the most easterly marathon in South Africa. How To Get There? 600km (7h) drive or fly to Durban and 150km (1h30) drive from King Shaka along the N2. What Else To Do There? Richards Bay is a small fishing town – either catch your own supper or enjoy the catch of day with a sundowner at one of the local restaurants whilst overlooking the Indian Ocean. Harbour cruises are available throughout the day and the adventurous might want to explore one of the many game reserves and national heritage sites (like St. Lucia and Hluhluwe Imfolozi Game Park) that are all within an hour’s drive. Note: Details below are not verified. No response received from organisers. Race Description A downhill marathon from the famous Cango Caves to the Infantry School in Oudtshoorn. Many Cape runners use this race to improve their Comrades and Two Oceans seeding. How To Get There? 1150km (11h+) drive. Recommend fly to George and 60km drive from there. What Else To Do There? Explore the Cango Caves and the local ostrich farms. Note: Awaiting confirmation of details from race organisers/Bloemfontein Achilles. Race Description A big field, double-lapper around Kwazulu Natal’s capital that takes you through the City of Choice and some of her leafy suburbs. I’m not generally a fan of big field double-lap races but this is a race worth doing – and is one of the best organised in the country. Comrades runners can enjoy the novelty of running past Pietermaritzburg’s famous City Hall without having another 90km ahead of them – and finish at Scottsville race course without being totally stuffed. Fittingly, more runners submit this as their Comrades qualifier than any other. Why Run It? 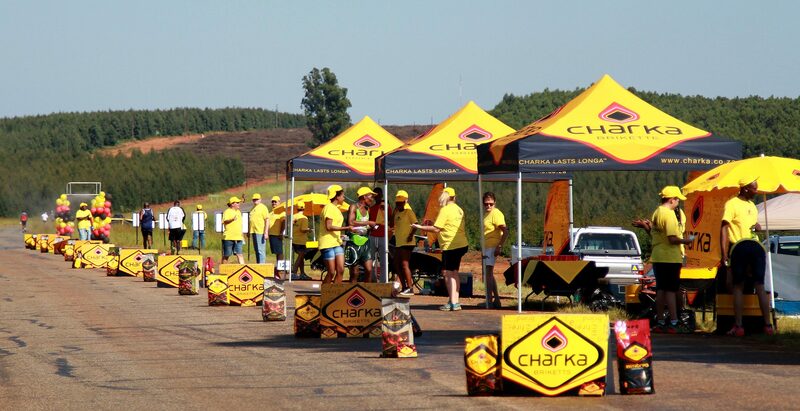 This is one of the few AIMS certified events in South Africa and is arguably the best organised race on the calendar. John Hall and his team operate on the mantra “We put the runners first.” and, although this is the most expensive February marathon, every cent is spent on ensuring a fantastic experience for the runner. For those that like working towards permanent numbers, you earn one with just five finishes here. How To Get There? 500km (5h) drive or fly to Durban and 100km (1h) drive from King Shaka. What Else To Do There? Plenty to do in Pietermaritzburg – check out http://www.pmbtourism.co.za/ or spend some time in the magnificent Midlands. 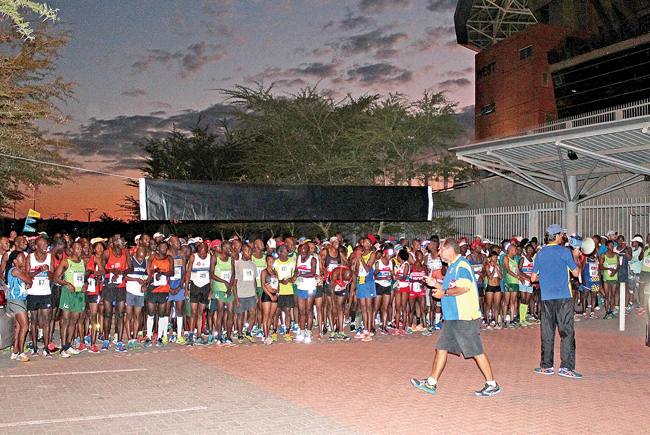 Experience the Township Marathon vibe (photo supplied). Race Description I’ve not run the course since it became a double-lapper but understand that it is fast and flat with lots of community participation. The race promises a unique township vibe and post-race entertainment. The route takes in several points of interest and historic sites like Walter Sisulu Square where the Freedom Charter was signed in 1955. Why Run It? A chance to do a township run without all the traffic and congestion that plagues Soweto. This is one of the few Gauteng marathons with less than 1,000 entrants and is a good option for a qualifier or debut marathon. How To Get There? Eldorado Park is 20km south west of central Joburg with many access points. Accommodation Options Soak up the township vibe by booking a room at the “Soweto Hotel” in Kliptown (where the Freedom Charter was signed / 3km from the race venue). What Else To Do There? Book yourself onto a township tour or explore the many famous and significant sites in the vicinity like Vilakazi Street and the Hector Pietersen Memorial Museum. Note: Details not verified – waiting for the Deloitte PR machine to get back to me. Race Description This race in the nation’s capital is one of the tougher marathons out there. The double-lap route winds you up Waterkloof Ridge and to the top of Klapperkop Hill before murdering your quads with a rapid descent that takes you all the way into the beautiful grounds of Pretoria Boys’ High School. Although the final kilometre is a juicy downhill, the preceding four kilometres are a steady climb that will test your weary legs. Why Run It? With over 10,000 participants over the various distances, this is a race for those who like their marathons big and hilly. I will update this page as additional information becomes available/is provided. If you have anything to add (or correct) please drop me a note. I plan to add route profiles and maps in future versions but don’t have time to chase these down at present. Marathon/ultra race organisers: I will be in contact to get information for future events but feel free to jump the gun and contact me directly. Thanks Casper, I’ll update the info for Kloppers this evening.